A growing cultural district that includes the Brooklyn Academy of Music has become such a tourist draw in recent years that it’s finally getting its own hotel, The Post has learned. Developer Second Development Services, whose projects include Richard Meier’s On Prospect Park, plans to begin construction this fall on a 200-room, full-service hotel at 95 Rockwell Place and to complete it within two years, project manager Gregory Atkins said yesterday. “The arrival of the Barclays Center coupled with the pipeline of new cultural-district projects in Downtown Brooklyn is driving demand for further hotel development,” said Tucker Reed, president of the Downtown Brooklyn Partnership. The hotel is being designed by Thomas Leeser, who has received rave reviews for projects including the London 2012 Olympic Park and Museum of the Moving Image in Astoria, Queens. It will include basement performance space, a rooftop bar, banquet hall and a ground-floor restaurant overlooking an outdoor arts plaza currently being built. Atkins — the former chief of staff for Borough President Marty Markowitz — said the district was long overdue to get a hotel. The closest hotel is a half mile away on Duffield Street in Downtown Brooklyn. 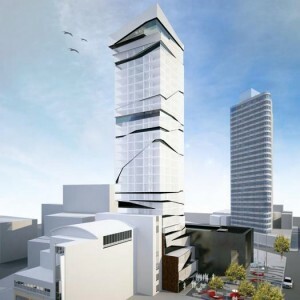 The news of the planned hotel comes while the cultural district is in the midst of big changes. Developer Two Trees Management Co., known largely for its work in DUMBO, is planning a 32-story, 300-plus-unit apartment tower for Flatbush Avenue and Ashland Place with 50,000 square feet of cultural space to be set aside for new movie theaters for the Brooklyn Academy of Music, a new branch of the Brooklyn Public Library and a performance area for local artists. A development team of Gotham Organization and DT Salazar, Inc. is building 600 apartments — half of which will be affordable units — as well as new cultural, community and commercial space on property bounded by Fulton Street, Rockwell Place and Ashland Place. And the city is planning to select a developer to bring new residential, cultural and commercial space to a city-owned site lot at Ashland Place and Lafayette Avenue.